Calligraphy (shū fǎ 书法) has traditionally been regarded as China's highest form of visual art - to the point that a person's character was judged by the elegance of their handwriting! Decorative calligraphy is found all over China, in temples and adorning the walls of caves and the sides of mountains and monuments. The basic tools of calligraphy - brush and ink - are also the tools of Chinese painting, with linework and tone the all-important components. Despite the ravages of time, war and ideology, there's still a lot to see architecturally. Traces of the past include the imperial structures of Beijing, the colonial buildings of Shanghai, the occasional rural village and Buddhist, Confucian and Taoist temples. Funerary art was already a feature of Chinese culture in Neolithic (xīn shí qì shí dài 新石器时代) times (9000-6000 BC), ranging from ritual vessels and weapons to pottery figures, jade and sacrificial vessels made of bronze. Earthenware production is almost as ancient, with the world's first proto-porcelain being produced in China in the 6th century AD, reaching its artistic peak under the Song rulers. China's language is officially Mandarin (pǔ tōng huà 普通话), as spoken in Beijing. The Chinese call it Putonghua. About 70% of the population speak Mandarin, but that's just the tip of the lingusitic iceberg. The country is awash with dialects, and dialects within dialects - and few of them are mutually intelligible. Of the seven major strains, Cantonese is the one most likely to be spoken in your local Chinese takeaway. It's the lingua franca of Guangdong, southern Guangxi, Hong Kong and (to an extent) Macau. Monk ask: What is the fanciest thing around this world? Huai Hai said: Sitting alone on the Da Xiong Hill top. That says the highest heartfelt feelling is undescribable by any word or mind, there is no differents with everything. 最后修改: 8 年, 2 个月 之前 由 dingpuzhao. China's literary heritage is huge, but unfortunately its untranslatability makes much of it inaccessible to Western readers. Traditionally there are two forms, the classical (largely Confucian) and the vernacular (such as the prose epics of the Ming dynasty). Chinese theatre is also known as opera because of the important role played by music, and has spawned such diverse arts as acrobatics, martial arts and stylised dance. Many Western film-lovers are fans of Chinese cinema, with releases enjoying success at film festivals and art-house cinemas. Recently there has been an emergence of talented 'fifth-generation' post-Cultural Revolution directors, including Zhang Yimou (Red Sorghum, Chen Kaige (Farewell, My Concubine), Wu Ziniu and Tian Zhuangzhuang. Add to them Hong Kong's East-meets-West action directors John Woo (Hard Boiled) and Ringo Lam (Full Contact) and you have a full-fledged, extremely successful film industry. Chinese cuisine is justifiably famous, memorably diverse - and generally not for the squeamish. The Chinese themselves like to say they'll eat anything with four legs except a table. For the most part, however, it's a case of doing ingenious things with a limited number of basic ingredients. The cuisine can be divided into four regional categories: Beijing/Mandarin and Shandong (with steamed bread and noodles as staples), Cantonese and Chaozhou (lightly cooked meats and vegetables), Shanghainese (the home of 'red cooking' and wuxi spare ribs) and Sichuan (spicy, with lots of chilli). Tea is the most common nonalcoholic beverage on sale, although Coca-Cola (both original and bogus) is making inroads, while beer is by far the most popular alcoholic drink. 'Wine' is a loose term which can cover oxidised and herb-soaked concoctions, rice wine and wine containing lizards, bees or pickled snakes. Another favourite is maotai, a spirit made from sorghum which smells like rubbing alcohol and makes a good substitute for petrol or paint thinner. Knowing the Tools "The Four Treasures"
Shuan Paper or Xuan Paper ( 宣紙 ) is the best paper for Chinese calligraphy. Rice paper is a misnomer used in the West since Shuan Paper contains no ingredient of rice. Many brands of "rice paper" sold from Western art stores are not actually Shuan Paper or the so-called rice paper. They are usually Cotton Paper "Mien Paper ( 棉紙 )" in long rolls which is also not made of cotton. By using the misnomer "rice paper" will most likely mislead most beginners in selecting the various kinds of Chinese calligraphy and painting paper used for many different purposes and effects. It’s sort of expensive for beginners to practice on Shuan Paper. Mao Bien Paper ( 毛邊紙 , Bamboo Paper ) is a cheaper substitute for practice. It's strongly recommended not to use newspapers to practice Chinese calligraphy. As newspaper is free and full of distractions, we may not want to focus and our progress will be limited. You may buy a brush (mao bi, 毛筆) in local Chinese bookstores or online. Choosing a brush is the most critical point of doing good Chinese calligraphy. A lot of brushes on the market, especially those not made specifically for Chinese calligraphy, may not conform to the requirements in practicing Chinese calligraphy. If we do not pick up a good brush, we might get frustrated and give up very, very soon because we cannot produce satisfactory strokes even if we are very gifted. Some details and characteristics of brushes are explained in P1: Selecting, Preparing, and Maintaining A Brush. We have to use the ink ( 墨 ) made specifically for Chinese calligraphy. Other ink such as Indian ink, colors, or paint won’t do. Traditionally people grind an ink stick ( 墨條 ) on the ink stone ( 硯臺 ). This is absolutely an indispensable step to master the Art of Chinese Calligraphy. Using bottled ink or liquid ink ( 墨汁 ) may hinder brush motions to certain extent because it does not contain all natural ingredients as in an ink stick. The preservatives in bottled ink will affect the quality and life of brush hairs to some extent. 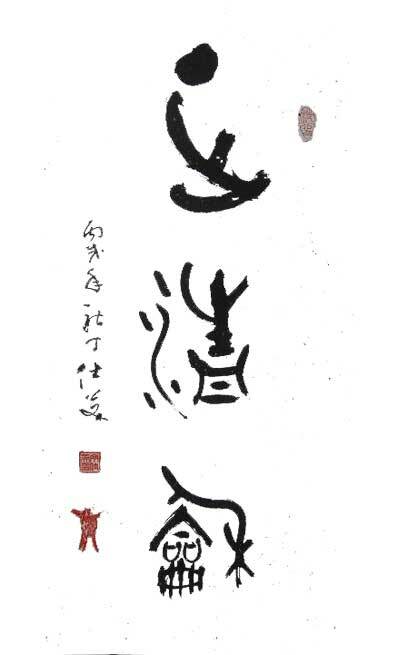 Formal Chinese calligraphy works written with some inferior or even famous brands of bottled ink will cause the ink smear during the processes of mounting the calligraphy in scroll form. Most people today use bottled ink to save the labor and time. Grinding an ink stick on the ink stone ( 研墨 or 磨墨 ) may be time consuming for today's beginners; however, it produces shades of beauty and increases the dexterity and strength of hands and wrists. We may adopt a compromising way by mixing a little water with bottled ink together on the ink stone. Then press and move the ink stick in a circular motion clockwise on the ink stone a few times, say, for a couple of minutes. This may save our time and also will preserve some advantages of using the "all natural" ink sticks. The secret to produce good ink in a shorter time is to press the ink stick hard downward and gently rotate in a circular motion. The following charts list choices for beginner's first styles, their features and contributions to future progress if a beginner focuses on any one of them for a few years and then goes from there. The Model Books ( 字帖 ) are the best lifetime teachers for learning Chinese calligraphy. 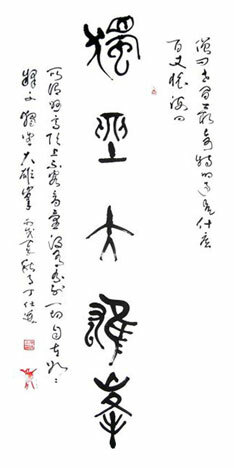 Every ancient Chinese calligrapher went through a long process in their life emulating ( Lin Mo 臨摹 or Lin Te 臨帖 ) from Character Models or Model Books which are masterpieces of previous masters. The more we dive in and the more humble we are, the more learning and knowledge we can retrieve from those masterpieces. The more details and likenesses we realize and transfer to our practice, the more progress we will make. The saying "If you start mimicking other artists, that's when you lose your own identity" does not apply in learning Chinese calligraphy and painting at the early stages. In fact, the better we can mimic models and masterpieces of Chinese calligraphy, the higher artistic levels we can reach. Besides mimicking the shape, structure, and size of each character in tiny, tiny details, we also pay attention to start, connection, turning, closing, shading, and even overtone of connection between several characters. Those nuances are the decisive factors that determine the level of an artist and also motivate beginners to continue practicing. and three sheets of emulation practice (center and bottom). The brushes are placed on a bamboo roll. Learning how to hold the brush ( 執筆 ) correctly is as important as choosing a good brush. Just as a swordsman needs to learn a good way to hold his weapon, Chinese calligraphy students will need a good way to hold the brush to guarantee their success in the art. The following are some inappropriate ways to hold a Chinese calligraphy brush for beginners. While there are no absolute rules in arts, experienced calligraphers may have different or contrary views. Like a violin player or a swordsman, the methods of holding a brush play undeniable roles in doing beautiful and good Chinese calligraphy. Each of the five fingers has supporting and contradicting forces with each other during brush motions and must be coordinated to generate good writing results.